Foo Fighters are a band that grew from humble beginnings into one of the world’s biggest stadium rock acts. Before the project was a band at all, Dave Grohl developed his songwriting skills with simple solo demo recordings. 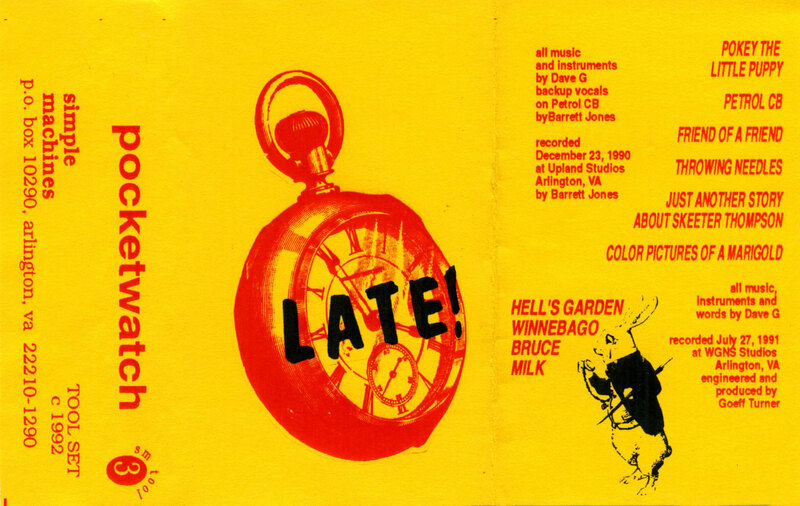 One batch of demos, released under the pseudonym Late!, was a ten-song cassette titled Pocketwatch (listen below). Dave Grohl was the drummer in the Virginia punk band Scream during the period of 1986–1990. It was during these years that Grohl recorded some of the songs that landed on the Pocketwatch cassette. The first six songs on Pocketwatch were recorded in 1990 with Barrett Jones at Upland Studios in Arlington, Virginia. Scream broke up in 1990. Later that year, Melvins leader Buzz Osborne connected his friend Dave Grohl with Nirvana, who were seeking a drummer. Grohl traveled to Seattle for an audition and joined the band shortly thereafter. Recordings from Grohl’s sessions with Barrett Jones would be combined with songs from a second recording session on Pocketwatch. In the summer of 1991, Dave recorded tracks with producer/engineer Geoff Turner at WGNS Studios in Arlington, Virginia. According to Simple Machines, Grohl “recorded about 10 songs, playing all the instruments himself.” Four of those tracks would become the second half of Pocketwatch. The Pocketwatch cassette contains several tracks that will be familiar to fans of Nirvana, Melvins and Foo Fighters. ‘Color Pictures of a Marigold’ – notable for its intimate vocals and tender acoustic strumming – was later released as ‘Marigold’ on the b-side of Nirvana’s ‘Heart-Shaped Box’ single. ‘Marigold’ carries the unique distinction of being the only Nirvana song that was neither written nor sung by Cobain. On ‘Just Another Story About Skeeter Thompson,’ Grohl tells an absurd story over a heavy dirge. The track was also released in 1992 on Melvins leader Buzz Osborne’s King Buzzo EP. Skeeter Thompson was the bassist of Scream. ‘Winnebago’ was later re-recorded and used as a Foo Fighters b-side on the ‘Exhausted’ single and other releases. According to the Dave Grohl biography This Is a Call, the Pocketwatch song ‘Friend of a Friend’ was “written on Kurt Cobain’s couch in the small hours of a bleak mid-winter; it’s a sensitive, tender observation of the intimate friendship between Cobain and Novoselic, the songwriter who ‘plays an old guitar, with a coin found by the phone‘ and his more gregarious, sociable best friend who ‘thinks he drinks too much. '” Grohl re-recorded ‘Friend of a Friend’ for the 2005 Foo Fighters album In Your Honor. Kurt Cobain died in 1994, sending Grohl (and millions of Nirvana fans) into mourning. Roughly eight months later, Grohl decided to record some songs by himself. In the documentary Foo Fighters: Back and Forth, Grohl says, “I decided that I was gonna take my favorite songs that I had written over the last four or five years – that no one had heard – and I was going to record them at a 24-track studio down the street from my house. And it was really exciting because I was doing it totally by myself.” That recording, made entirely by Grohl, became the Foo Fighters’ self-titled 1995 debut album. The Pocketwatch cassette is a rough batch of song demos, some of which became associated with Nirvana, Foo Fighters, and Melvins. It is not a Foo Fighters project. 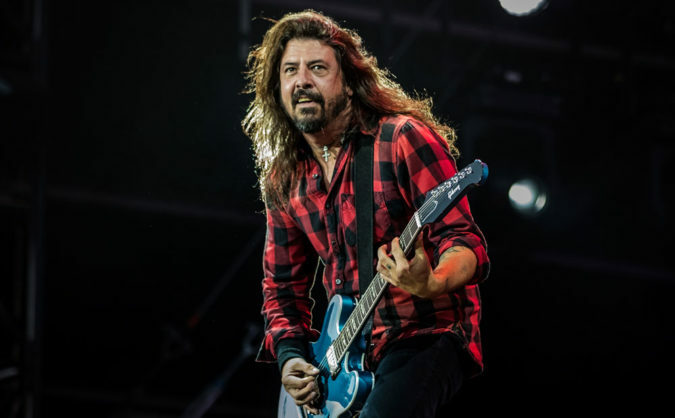 However, it is an audio portrait of Dave Grohl’s DIY songwriting and recording skills – skills which Grohl would develop into Foo Fighters’ debut and the chart-topping band that followed.